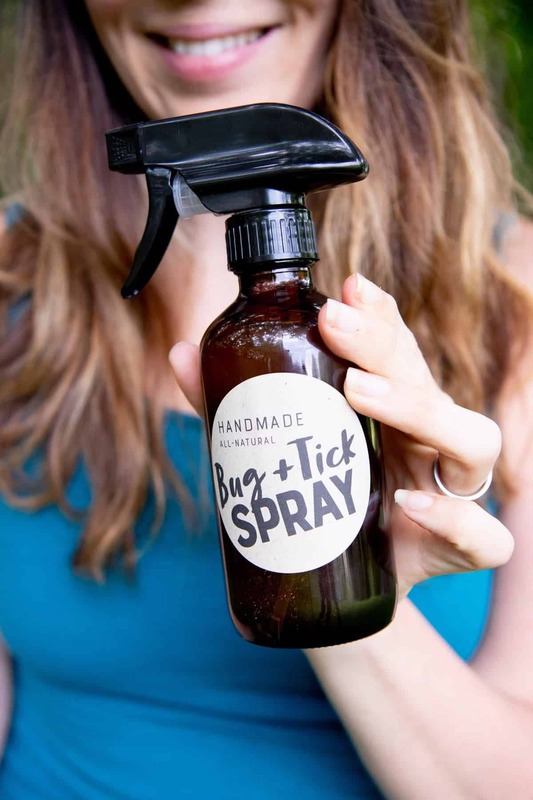 Skip the DEET- and toxic chemical-laden bug spray this summer, and instead make this Homemade All-Natural Tick and Bug Spray to keep the bites at bay. I’m a bug magnet. I always have been. My husband and I can be sitting outside, and within five minutes, I’ll get bit no less than 10 times, and the bugs won’t even come near him! When I was a kid, people used to say it was because I was so sweet! And while that’s a nice sentiment, it doesn’t make the thousands of bug bites I’ve gotten over the course of my life any less itchy. I’m not sure what it is about me that is so attractive to buggies, but man, I really wish they’d, uh, bug off. If I want to sit outside in the summer, I literally have to surround myself with citronella candles and douse myself in bug spray. 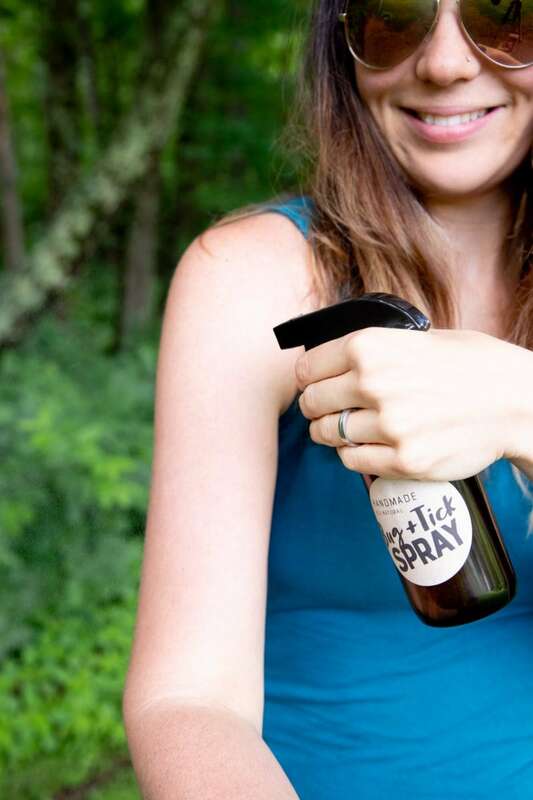 I’ve never really felt great about spraying super chemically bug spray all over my skin, so I’ve been working on perfecting an all-natural homemade tick and bug spray for the past few years. My previous blend of citronella, lavender, clove, and eucalyptus worked incredibly well for mosquitoes and those annoying biting flies (I’m looking at you, deer flies! ), but it did nothing to keep off the ticks that have infested our yard. I started to do a bit of research about repelling ticks and landed on adding rose geranium essential oil. Rose geranium is the essential oil to repel ticks, and in particular, the pelargonium capitatum x radens variety of rose geranium is the most effective. I also added some cedarwood oil—ticks loathe the smell of cedar (but I love it!). 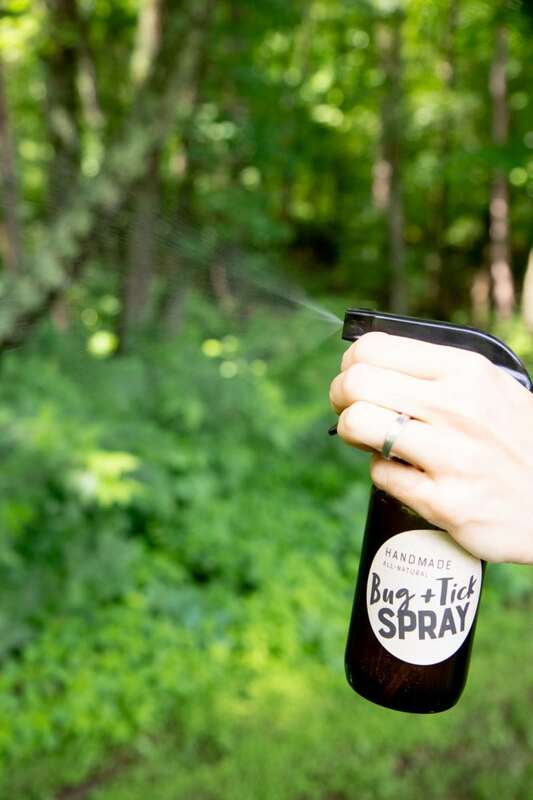 We actually spray our yard with cedar oil to help keep the tick population down. The best part about this blend? It actually works! I mean, I’m not guaranteeing you’ll never get bit again wearing this stuff, but it definitely reduces my bite-levels dramatically. Now, instead of getting bit 70 times in an evening (this literally happened one night while visiting Canada—we counted), I might get bit once or twice. I’ll take it! Especially when I factor in the whole not-spraying-my-body-with-scary-chemicals-regularly aspect. It’s a win! The key here is to apply liberally and reapply frequently—I’m talking every 1-2 hours. This isn’t like the DEET stuff where you can spray it once and be good all afternoon. It’s important to keep reapplying. I will say, gathering all the essential oils takes a bit of investment if you don’t already have them on hand. If you have to buy all the essential oils I list below, you’re looking at right around $125 (more if you want premium brands). Which sounds crazy, but it ends up being just shy of $6 per batch of bug spray. 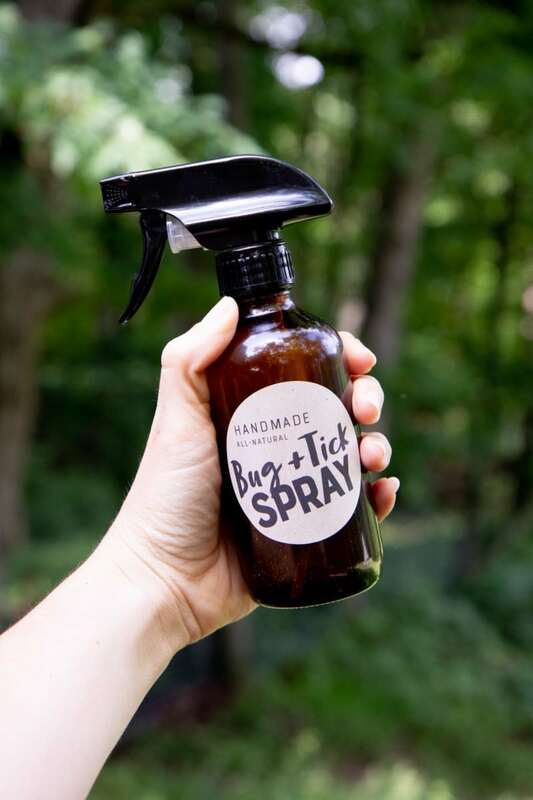 Considering store-bought bottles of natural bug spray run $10-$12 each for a smaller batch than what you’ll be making? You’ll definitely be money ahead over the course of a summer. Especially when I tell you that this mix works way better than any store-bought stuff I’ve ever tried! If you are short on cash though, I recommend starting with the citronella and rose geranium essential oils—those two will do a lot on their own! In fact, many people use a dab of rose geranium oil “neat” on their wrists and ankles to help repel ticks during hikes. You can also tweak this recipe to fit your own bug-repelling needs. I’ve listed the types of bugs that each oil repels in the recipe below, so feel free to leave out any that aren’t applicable to your area of the world (or add more of a specific kind if you have a real infestation). I’m not associated with any essential oil companies and have no loyalties there, so I’ve linked to each of the brands we use down in the recipe below. 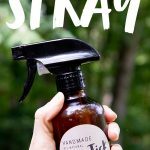 As far as bottles go, the spray is pictured here in eight-ounce amber glass Boston bottles with a heavy duty sprayer. The amber is great because it blocks UV light that breaks down the effectiveness of the essential oils. And the heavy duty sprayer is nice because it really pumps out the spray so you’re covered. However, the heavy duty sprayer goes through the spray MUCH faster than a fine mist sprayer (like this). 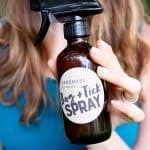 I actually have the tick spray in both kinds of bottles. I use the heavy duty sprayer for the first application of the day, and then the fine mist sprayer for reapplication throughout the day. As always, make sure you label your homemade creation! You can download the labels I use in these pictures below. They are formatted to work with Avery 22808 Kraft Paper 2” round labels. Combine all essential oils and the apple cider vinegar or witch hazel in the eight ounce glass spray bottle. Top off bottle with distilled or filtered water. Screw on sprayer and shake well. Apply label. To use: Shake bottle well, then apply liberally on exposed skin every 1-2 hours while outdoors. Some natural bug spray recipes will call for vodka in place of the apple cider vinegar or witch hazel. This works just fine, but the vodka will sting like a mother trucker on any sort of open wound (or freshly shaven legs). We made one batch with vodka and won’t be doing that again! This makes for a very strong bug spray, which works for us buried in the woods in the country. If you just need some spray to keep the backyard mosquitos away in the city? You’ll probably be able to get by with half-strength (use half the amount of essential oils) recipe and stretch your oils! If you don’t have citronella oil (or don’t want to buy it), you can use lemongrass oil as a replacement. I have phases of being tasty to bugs, some years I’m a covered in bites and others not really, maybe it’s the weather, we haven’t had a lot of summer over the past couple of years! I did get bitten really badly at my brother’s wedding and had to duck out of the reception to a chemist to get something for the massive bite that took up half my leg, I’m blaming that on Spanish bugs being more vicious than English ones!I’ve been using a similar spray on my house plants to stop the little flies that hang around, they’re like fruit flies and really annoying – I’ve been using rosemary, tea tree, lavender and peppermint and it’s gotten rid of most of them! Thank you so much Cassie for posting this! I have been looking for something that working that is more on the natural side and haven’t been very successful at it. Have bought the Buggins from the store that says all natural that is lavender and mint which only works for just a short amount of time and I am the same way the bugs love the smell of my skin over my kids and Josh’s! I appreciate your blog so much you and Craig have the neatest all natural ideas! This is something I definitely have to try. I am a magnet for bugs all summer long. Last week on vacation, I literally came home looking like I had chicken pox from all the bug bites I had. I also sit with citronella candles next to me when I’m outside in the evening. I’m going to have to try this. I too, am a bug magnet. I spend most evenings inside because any bite I get swells up the size of a golf ball. I need this in my life because I also get eaten alive by bugs. Thank you for sharing this. What kind of Witch Hazel did you use? 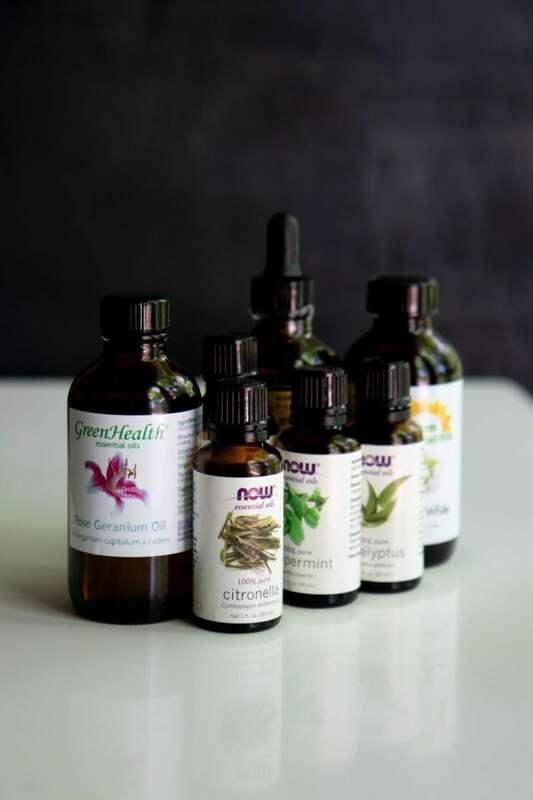 I’m new to at home tinkering with essential oils…. I just use whichever is cheapest, usually Thayers. OHM you are awesome, the bugs up here are horrible and I believe you about the 70 bites they seem to go for me the same way. Definitely going to make some of this. I hate mosquitos! They love to bite me, and each bite will swell up to the size of a quarter before fading. Gross. Can’t wait to give this natural spray a try. Thank you SO MUCH for this! I’m a bug magnet as well and have too experienced 70 bites in one sitting. And then the bites swell up, so I’m pretty attractive in the summer time. Lol. i will be making a batch of this soon! Ha! I am the same way! Bugs LOVE me! I also happen to be super allergic, so mosquitoes really make me miserable. I tried this last year, but it didn’t really work! Maybe my combo of smells was too complicated. Also, I had trouble getting the spray to come out. The oils would eventually gum up the sprayer and it would no longer work. Any of these issues come up?? I use bottles specifically made for essential oils and have never had an issue, maybe that’s what is going on? Also, it occurs to me that different regions have different bugs and probably could use a duffle rent mixture/combination. Maybe try experimenting a bit? I know this particular combo works really well on our bugs! I’m excited to try this! We are starting a vegetable garden this year (using lots of tips and tricks from your blog), and the bugs are already making me crazy. Where do you get your essential oils? Amazon? Local store? I’ve been intimidated by big displays of essential oils in our natural foods store, but you are giving me the courage to give them a shot! Do you have the printable for the bug spray? Thanks! 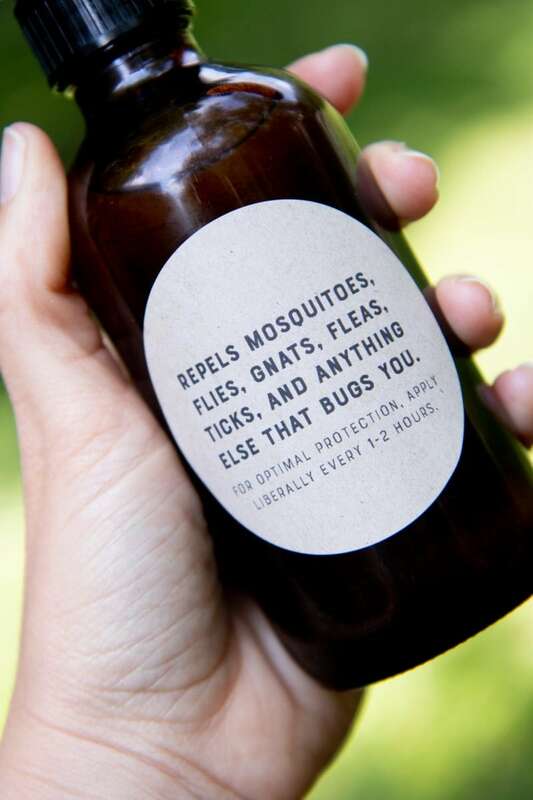 I also would love the label for this bug spray. I love Cassie’s labels! I used the Linen Label and I would like all my labels to match like she does! Can help us out Cassie? Would this work on crawling insects like ticks or ants or does it just work on flies/mosquitos? will this combination work for ants, too? I’ve never tried it on ants, sorry! Hello, Cassie! I am a Manitoban Canadian! What part of Canada is your hubby from?! I am looking forward to making this bug spray not just for outdoors, but for spraying around the beds where we would travel to. Our daughter lives in an apartment with weird bug activity on her floor – not in her apartment yet! Thank Goodness!!! But, I would like to make such a spray for her to use in her apartment – around the doorway and baseboards… just to be safe! I bought the non-alcoholic Witch Hazel to use, but now am having second thoughts! Maybe I should have bought the alcoholic kind (since the other option, Vodka, is alcohol?) Looking forward to your feedback! Love your recipes. Have tried the linen spray and hand spray. Could you provide the bug spray label too? Just updated this post with new labels above! Can’t wait to try this! I, too, am a bug magnet. Are you blood type O negative, by chance? We made this and love it. However, the spray mechanism on the bottle gets jammed and won’t work. I’m wondering if shaking the bottle might be causing the problem. Do you ever have issues with the sprayer? Do you know if this could be sprayed on dogs? my Great Dane gets eaten well we go hiking. Pets can be really sensitive to essential oils (and different breeds react differently), so I highly recommend checking with your vet. I was wondering, I’m, really sensitive to lavender. If I don’t use the lavender is it reduced effectiveness? Is there something else I can substitute? This might sound like an overly specific question, but I thought I’d ask anyway: I noticed that we have an infestation of Asian tiger mosquitos where in DC. They don’t seem to be bothered by citronella, eucalyptus and/or rose geranium at all (despite what the internet says), so I’m thinking of getting some cinnamon oil, which has been touted as a great weapon against these buggers. I guess my question is mostly whether it’s okay to just use any random combination of essential oils or whether there are any guidelines to follow. I noticed you’re using different amounts of different oils… how did you end up with these numbers? Any rules of thumbs, or is it more of a “Ah, you know, if you got more bugs X than bugs Y, just use a lot more deterrent for bug X than for bug Y.”? You are totally fine mixing and matching oils to figure out what works for the bugs in your neck of the woods. :) And, yes, the numbers for us mostly come from (A) the desire we have to repel a specific bug and (B) the strength/potency of certain oils. Cinnamon oil is pretty strong, so you could probably get by with a lower amount, whereas rose geranium oil can be pretty moderately scented, so I use a lot!